ENCE vs Na’Vi will probably be the most intense matchup in the quarterfinals of The StarSeries & i-League Season 7. Both teams made it to here with only 1 loss during the group stage. This would surely be an exciting match so stay tuned and read our detailed analysis and betting prediction. Both of these teams played against 4 competitors during the group stage and were tied for 3rd place with Team Vitality. However, ENCE had weaker opponents in the group stage and they threw too many rounds in vain. This is not the same ENCE that we saw on the last major. ENCE played against 4 teams and they finished the group stage with 3 wins and 1 loss. Teams that they won against are Team Spirit (2-0), ViCi Gaming (2-0), and FaZe Clan (2-1). Wins against Tier 2 teams are nothing special. Their only real match was against FaZe and they barely made it. It seems like they struggled against AWPs and that could be a problem for them against Na’Vi. We can freely say that solo s1mple is the most talented AWP player in the world and he rarely misses a shot. If ENCE does nothing about that problem their chances of winning are really low. Their only loss in the group stage was against Team Vitality (1-2) and that was nothing unexpected. Na’Vi also played against 4 teams and they also had 3-1 the final score after the group stage. They won against BIG (2-0), Ninjas in Pyjamas (2-1) and NRG Esports (2-0). Compared to ENCE’s opponents, all of those teams are Tier 1. Na’Vi had no problem against teams that are on their level. They did not make any mistakes except for one. Na’Vi really underestimated ViCi Gaming and they eventually lost (1-2). ViCi took the first map Inferno with 3-16. After that, Na’Vi tried to come back and easily took Train 16-6 only to lose on Nuke with 7-16. On this kind of tournaments, you only have room for one mistake. Na’Vi already made that mistake by underestimating ViCi and I do not believe that they would do it again against ENCE. This matchup is really hard to predict. Both of these teams are top tier, and matchups like this are expected to be seen in The Grand Finals. Last matchups they had was in IEM Katowice 2019, in which ENCE won 2-1 on Train (14-16), Dust II (16-3), and Mirage (14-16). The one before that was on ESL One Cologne 2018, in which Na’Vi won 2-1 on Dust II (16-14), Mirage (14-16), and Nuke (7-16). So, even the head to head statistic is tied. The maps on both matches were similar and Dust2 and Mirage could be their picks again. I’m sure that 2-1 is guaranteed. I would give a bit more advantage to Na’Vi in this matchup because I think that they looked better during this tournament and ENCE is struggling. Na’Vi would probably win Dust2 and ENCE Mirage. The third map, the so-called decider is the main factor of this game. Overpass and Cache are permabans and they are out of the picture. Na’Vi has an advantage on Inferno, ENCE on Nuke and Train is a neutral map where both teams perform pretty well. 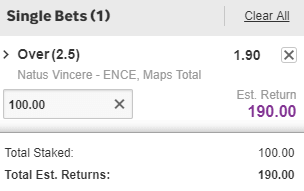 Whatever happens this match would go into third map so our tip here is to bet on the number of maps, more than 2,5.